Have you ever seen a long long friend turn a corner (after you’ve been straining your head in wait) to have them appear and your head fills up with glee as your pulse races in happiness and expectation? It’s called being smitten. That is how I’m starting to feel about a Molly Dooker wine. 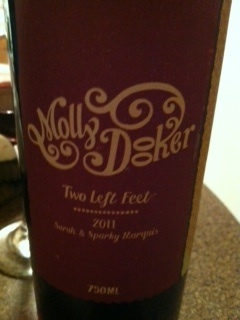 “Too Left Feet” is a blend of Shiraz, Cabernet Sauvignon and Merlot. On the nose it is baked plums, soft leather, light oak, and spicy chocolate. On the tongue, the tannins are soft (from the Merlot addition) and it tastes like your favorite Christmas dessert wrapped up in a chocolate birthday cupcake (with the same flavor profiles as on the nose). The taste is smooth and balanced and the alcohol (at 15.5%!) is not overpowering. It has such a bright taste, that I almost expected bubbles. I would give this high marks easily, especially since you can find the brand anywhere (even in MSP), and with the right friends (I have) the right dessert (Jill is making chocolate molten cake to go with it), and the right day (can you say stress? ), it puts the right spin on the day. I don’t think I’m working out tomorrow–probably something to do with a coordination problem after drinking this.